For nearly three decades, the personal computer market has been all about more: more speed, more RAM, more pixels, more features. And sure enough, when Apple introduced OS X Mavericks at this year’s Worldwide Developers Conference, the company highlighted plenty of the operating system’s new capabilities, such as better support for multiple displays and iCloud Keychain. The keystone of Apple’s tenth release of OS X, however, is firmly positioned in the less category—specifically, a dramatic reduction in power consumption, achieved through all sorts of cool software tricks, such as exerting more control over the way apps run to increase the time CPUs spend idle, throttling down apps that are not being actively used, and even compressing memory to reduce swap disk access. According to the company, these changes could boost the average MacBook’s battery life by a factor of 50 percent; coupled with the recent introduction of Intel’s new low-power Haswell chipset, such improvements could easily mean going an entire day—or more—without having to plug in. Despite representing a radical departure from the way computers and operating systems are marketed, this newfound fondness for saving electricity makes a lot of strategic sense for Apple. Putting so much emphasis on battery life may seem like an odd choice, considering that OS X runs both on portable computers and on machines that usually call a desk home, but it’s an obvious one if you consider that Apple laptops have outsold their desktop counterparts for some time. After all, as early as 2010, nearly three-quarters of all Macs the company sold were MacBooks. In fact, Apple has been playing favorites for a while: MacBook Pros have so far been the only recipient of a Retina screen, while the MacBook Air was the first to be equipped with Intel’s Haswell chipset. There are probably some technical reasons behind these choices; for example, a 27-inch iMac with a Retina screen would approach 4K resolution, requiring very powerful (and very expensive) hardware. But I am sure that the fact that customers are buying three MacBooks for every iMac/Mac mini/Mac Pro that Apple sells plays a significant role in these choices too. In this context, reducing power consumption is the next logical step in Apple’s quest for the perfect portable computer. Apple’s latest MacBook Air models promise 9 to 12 hours of battery life. A MacBook Air that can offer 10 hours of battery life—a number that is only going to go up once Mavericks ships—is no longer just a high-end laptop, but rather a machine that combines the power of a full-fledged PC with the convenience of an iPad, in a package that’s less than double the weight of a tablet. Thus, Apple can now present its hardware on a perfect continuum, where customers can choose a product that neatly fits their needs without having to make what they would likely believe to be unreasonable compromises—or, worse, deciding to look at the competition for an alternative. The jump from iMac to MacBook Pro to MacBook Air to iPad is becoming more about selecting a device that fits your lifestyle and less about keeping tabs on technical details such as CPU speed, megabytes of RAM, and hours of battery power. That’s not to say that desktops won’t benefit from Apple’s renewed push for power efficiency. I honestly cannot remember the last time I powered down one of my Macs, at least on purpose: Like, I suspect, most users, I don’t regularly pull the plugs on my computers, preferring instead to leave them idling all day long, ready to do my bidding at a moment’s notice. 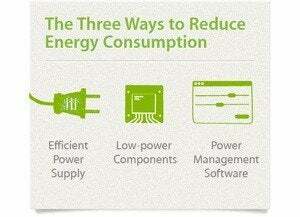 Apple takes a three-prong approach to energy efficiency. Given the millions of Macs in existence, any improvement to their ability to conserve power is likely to have a positive effect on the environment. And you don’t have to be a tree hugger to consider that a good thing: Various reports [PDF] have shown time and again that parasitic standby power accounts for a sizable percentage of overall electricity use, wasting billions of dollars of our money and imposing additional load on our already strained infrastructure. Even better, the new power-saving features that Apple is introducing won’t come at a significant premium to consumers; many, in fact, will take effect just by virtue of the user’s upgrading to Mavericks, without the need for new hardware. Everyone wins: Customers will save on their electricity bills, the reduced emissions will lower the devices’ impact on the environment, and our poor power grid will suffer a little less load. Ultimately, Apple is making power consumption a feature that distinguishes its products from the competition and that allows it to both capture a higher share of the market and charge customers a premium for the privilege of owning a Mac. Using history as a guide, we can bet that other manufacturers will soon follow suit, forcing the sort of race that, for the past 30 years, has been focused on CPU speeds. If the end results of this competition are the same, in a decade our computers may be able to go days or even weeks without needing a charge, opening a whole new world of opportunities for everything from saving money to helping the environment—and that seems like a worthy goal indeed.